I hung out at BJ & Doll's last night rocking the house on the Rock Band drumset. Doll and I watched Step Brothers and I finally made my way home at midnight. I realized I didn't have my phone and figured I left it. I wasn't going to go back for it so late. I assured myself my world wouldn't end without a phone and tried to relax. I finally fell asleep reading. This morning, I woke up at 7:38 and was worried I was late for work. Then I remembered it's a holiday and decided to go back to bed. I figured I'd sleep for an hour or so and then start my day. And then I woke up at 11:30. It was glorious! I haven't slept so well in a long time! I had dreams of riding my old ten-speed around Wichita. The day was beautiful and everyone was friendly and thought my bike was kickass. I even had a basket! It was just lovely! And I think this satisfying sleep session is all a result of not having my phone making noises all night. So maybe I'll turn it off at night. Okay of course that's not going to happen. I might miss something. But I have also, of course, decided I want a bike again. I want a cute one with a basket. Like the Pirate Scurvy bike I told you about forever ago. 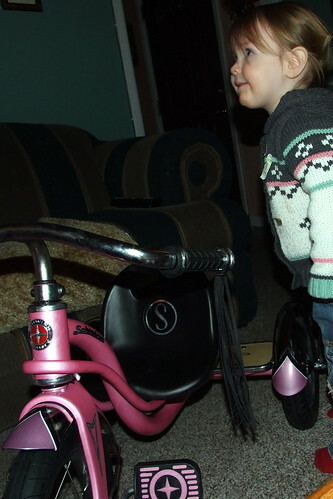 Target has a cute pink Schwinn that would match Sophia's trike. I also thought I might look at Bicycle X-Change to see if they had anything cool for cheap. Any suggestions, Wichita?